Time is one of the most important things in modern society. Without time keeping, it would be difficult to arrange meetings, take the bus or train or be on time on a wedding ceremony. Not only humans rely on time. Every computer has an internal clock which is used when time stamping your email and documents, schedule your backups and warn you when you have an appointment. Therefore also computers should know the current time with some accuracy. To synchronize computers to known good time sources over the internet, the NTP protocol has been defined which allows to obtain the current time from internet time servers. The servers ntp1.linocomm.net to ntp4.linocomm.net are such public internet time servers, operated by the internet services company Linocomm. The servers provide NTP services to NTP and SNTP clients on the internet. All time servers are at least stratum 2 servers, which means that the servers are directly connected to other time servers which take their time from a number of official reference clocks (atomic clock, radio clock, GPS or whatever) in different geographical regions. The four time servers are interconnected to give an extra layer of synchronisation. Time server ntp4.linocomm.net is a Stratum 1 server located in the Netherlands with its own reference clock. Time synchronisation with several upstream servers in different geographical regions gives redundancy when network failures occur. In practice this means that the time these servers provide are accurate within a few milliseconds. This is good enough for most private and commercial applications. Server ntp1.linocomm.net is located in a data center in Arizona US, which makes it the ideal time server for computers in the Southwestern United States and Mexico, but clients from all over the world are allowed to connect to this server. The only drawback is that distant clients might observe a few more milliseconds error in the received time signal compared to the time served by time servers closer to their location. Time server ntp2.linocomm.net is down but will serve Asia. Time server ntp3.linocomm.net is located in Groningen in the Netherlands and serves Western Europe where time server ntp4 is located in the Netherlands and serves some local projects. Time server ntp4 is the most accurate in the network because it has its own timebase with a GPS+PPS receiver. How do I connect to your time servers? You shouldn't connect to these servers directly, unless you operate a Stratum 3 server with a large number of clients. Serving time takes up a small amount of CPU and network resources, and if enough clients would decide to connect to our time servers directly, the servers might go on their knees because of the load. To achieve load balance, the time servers are therefore part of the load balance pools of the voluntary organization www.pool.ntp.org and you should connect to their load balanced pools of time servers instead. Their website gives more information on how to configure your computer to make use of the time services provided by our four time servers and more than 1000 other servers operated by volunteers. How well do your time servers perform? Statitics about the performance and accuracy of our time servers in the last few days in the NTP pool can be found here at the website of www.pool.ntp.org. The lists of upstream servers are refreshed every five minutes. The values in the columns delay, offset and jitter are in milliseconds. The delay is a measurement of the network delay when retrieving the time from the remote server. The offset is the current difference between the internal clock of our timeserver and the remote clock. Finally jitter gives the variation in the time difference between subsequent requests. That is possible. Just send an email to and I will see how I can help you. Please do not send requests for help on configuring NTP on your specific computer system. I do not have much knowledge of computer systems other than my own, so I will probably not be the right person to help you. The server in Kazakhstan proved to be a disaster regarding reliability and has been abandoned. Currently the time serving for ntp2.linocomm.net has been taken over by a server in Paris. The server in Phoenix Arizona is also not in use anymore due to price and performance considerations. ntp1.linocomm.net is now served from Rotterdam in the Netherlands. Due to these changes, all NTP servers are currently in Western Europe, serving mainly Europe. As a plus side, all servers now serve on both IPv4 and IPv6, although IPv6 service on ntp4.linocomm.net is not stable due to network issues. A server in Almaty Kazakhstan has been commissioned to become the ntp2.linocomm.net time server serving Central Asia. Time server ntp2.linocomm.net has been out of order for some time. The server will go live again in the near future. A decision of the location has not been made yet. The server will however probably by in Asia for optimal geographic coverage. Time server ntp1.linocomm.net has been moved to a new server in Phoenix, Arizona. Time server ntp2.linocomm.net has been moved to a new server in France. Time server ntp2.linocomm.net has been taken out of service temporarily due to bad timing performance. Time server ntp3.linocomm.net can now both be reached over IPv4 and IPv6. Time server ntp4.linocomm.net can act as an IPv6 client, but not yet as an IPv6 server due to limitations in the IPv6 port forwarding capabilities of the used router. That issue should be resolved in a few months. Time server ntp2.linocomm.net has been moved to a server in Amsterdam. The time stability of this server is acceptable but not excellent due to the specific configuration. Time server ntp3.linocomm.net has been moved to a new server in Groningen. The server provides time to the NTP pool at the maximum possible bandwidth setting. Time server ntp1.linocomm.net has been moved to a new server in Arizona. The server in Panama was not always available and there were no good stratum 1 and 2 servers nearby to synchronize. Time server ntp4.linocomm.net is upgraded to a stratum 1 server. The time source is a Garmin 18x LVC GPS with PPS output. The whole process of the upgrade is described here. Time server ntp2.linocomm.net is moved to a new server in France to increase the reach of our time serving network. Time server ntp2.linocomm.net is moved from our test server in Florida to our production server in Virginia. This should give less interuptions in service. 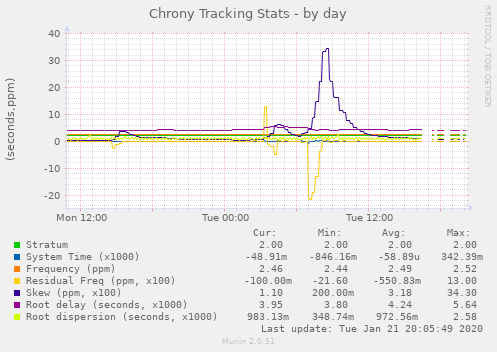 Time server ntp4.linocomm.net has been made public after both the server and network connection have shown excellent stability in the last six months. Time server ntp3.linocomm.net is added to the pool. This is the most powerful of the three, with a dual core processor connected with a 100 mbit/sec line. Due to a small default amount of lockable memory, the ntpd time server daemon on ntp1.linocomm.net stopped with an out of memory error. The memory limit has been increased from 32k to 8192k, so this error should not happen again in the future. 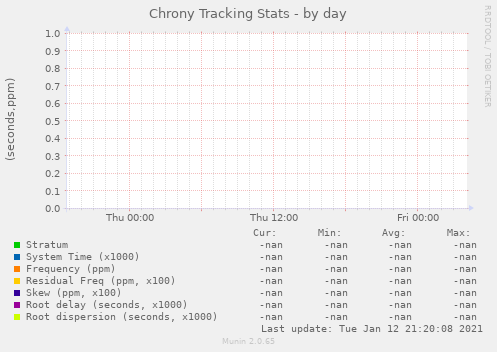 Time server ntp2.linocomm.net has been down for about one hour. The technical support described the incident as "caused by a handyman who had not followed the instructions". The server is up again and everything is working fine. The time served by the Linux based ntp1.linocomm.net and FreeBSD based ntp2.linocomm.net appears so stable, that I have decided to promote both to the Stratum 2 server level. The interconnection between both servers will stay to give a layer of redundancy and see when one of the servers drifts away. Time server ntp2.linocomm.net comes alive. It is currently a Stratum 4 server getting its time from ntp1.linocomm.net, but when it proves to be stable it will be promoted to either Stratum 3 or Stratum 2. There is much potential in this server as a public Stratum 2 server because the machine is underloaded and during normal operation doesn't perform much I/O which might interfer with proper time keeping. This home page is created. The subdomain ntp1.linocomm.net is created and the server is signed up with pool.ntp.org.